Lots of SMB marketers churn out content on interesting topics in of-the-moment formats. Very little of this content actually helps with marketing objectives. Why? Because it does not align with what SMBs want for topics, specificity and even product information. Here’s how to hit the mark on each one of these asks. Comprehensibility does not mean dumbing down your content. It means having a clear purpose for each piece of content, and a logical flow throughout it. A good piece of content starts with an outline that spells out the target reader, the purpose of the piece, the main assertion and why the reader should care, and the points to build out the topic. It should go without saying, but be sure the author knows something about the topic – otherwise it won’t provide real value. “Easy to understand” also means providing a clear definition for any technical terms you use – or better yet, avoiding jargon altogether. 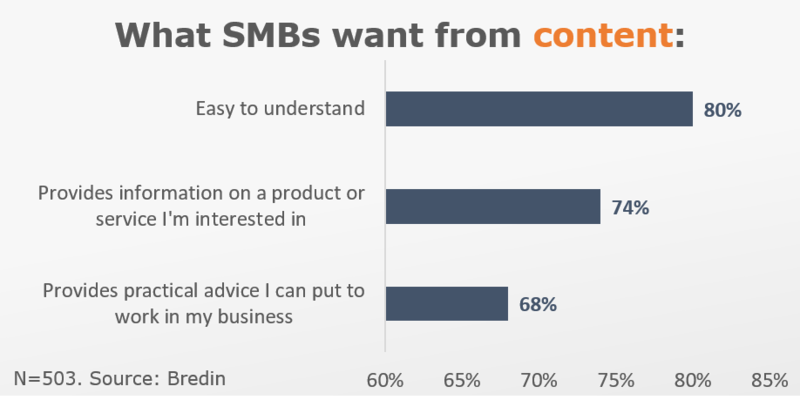 SMBs don’t just want business management advice from you. They want to know how your products and services can help them achieve their business goals. While not every content element you create should tie to a product or service offering, where it makes sense, include links to relevant products so SMBs can easily move along the sales path – instead of doing a search and perhaps ending up on a competitors’ site. Developing focused content will help to make your content actionable – which is essential for engaging SMBs. A good rule of thumb for effective SMB content is that it enables them to turn from their screen and put your advice into action right away. For example, are you empowering them to make one quick change to improve collections, make a better sales call, use their time more productively, or reduce shopping cart abandons on their website? Alice is America's foremost small business expert, with over 20 years of experience in the small business market. She has provided highly practical, actionable advice to countless entrepreneurs through her books, syndicated newspaper column, radio commentary and advice on small business forums on AOL, the Microsoft Network and elsewhere. Her unique insight into the needs of this audience has made her an invaluable resource to leading SMB marketers.